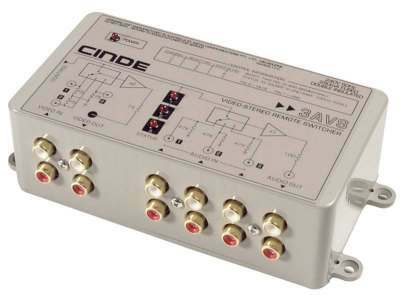 4-input, video & stereo remote switcher in compact ABS case with mounting flanges. Designed for use with control systems such as AMX or Crestron but can be controlled from a simple switch panel or parallel interface (not supplied). One of 4 inputs can be selected by momentary input closure to ground; LED's on the top cover indicate the current selection. Note that this unit can only be controlled externally. Control connector (D9) pinout is shown on top cover. Remote LED indicators may also be connected via the control port.